We love it when local guys do good, especially when that guy is Steve Marsh. 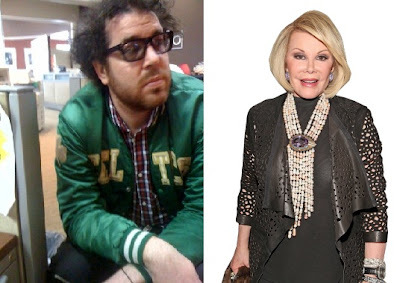 The local scribe just penned an interview with the legendary Joan Rivers for New York Magazine, and it's (of course) a riot. So how do you make people laugh when nothing’s shocking? There’s always something shocking. Believe me. There’s always something that you want to talk about that’s just insane. Like this Casey Anthony case. Why are people comparing it to OJ though? I’m shocked by that. Because it’s a total travesty of the judicial system. It just shows you yet again that it should be totally revamped — that it’s broken. Absolutely broken. She’s OJ with a uterus! How long will you be able to do Casey Anthony jokes, though. What's the measure? It depends where it is in the psyche of your audience. OJ is in there forever. Arnold Schwarzenegger’s probably got two more weeks.